South America has long been the stuff of legends in the annals of motorcycle travel. Several of the world’s most famous motorcycle journeys take place there – Adventures that are on the “bucket list” of motorcycle travelers from all over the world. Many of these journeys are ones which many riders can only dream of experiencing. Imagine beginning a trip with a kickoff dinner at Llao Llao in Bariloche – probably the most famous hotel in South America, and surely the most iconic. 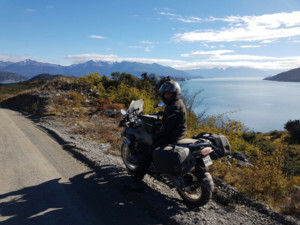 Ride through Patagonia and Tierra del Fuego to Ushuaia – the southernmost point in the world to which it’s possible to ride a motorcycle, topped off perhaps with a cruise to Antarctica. During your trek from Bariloche to Ushuaia, imagine visiting the Perito Moreno Glacier, having a free day to explore Torres del Paine National Park in Chile, culminating with a ride through Tierra del Fuego National Park in Ushuaia. Or, perhaps you’d like book an incredible off-road adventure through some of the most remote and beautiful parts of the Andes Mountains. Begin and end “Los Andes Misteriosos” in Mendoza, Argentina – the heart of Argentina’s wine country. Other riders may prefer our Machu Picchu Excursion Adventure, featuring an exciting ride that includes a visit to the ancient Inca civilization at Machu Picchu. Ayres Adventures offers all of these exciting possibilities. In South America, the people are warm and friendly, the food is great, and road conditions vary from wonderful to wild! You don’t have to be an experienced enduro rider to travel to the continent’s most interesting attractions. While there are some great off-road opportunities, you can visit many of the most popular attractions without leaving the pavement. Ayres Adventures was originally founded to offer tours in South America and we have more experience there than any other tour company. We’ve carefully selected routes that provide a safe and enjoyable trip. For very experienced riders, our South American tours are suitable for couples wishing to ride two-up. All of our South American tours include the use of a comfortable support vehicle for non-riding companions and for carrying luggage. Despite its legendary status as an attraction for the world’s most adventurous motorcyclists, in many respects South America remains one of the best-kept secrets in the world of motorcycle travel. We believe that you, like so many of our Adventurers before you, will be pleasantly surprised at the quality of the meals and accommodations, the friendliness of the people, the natural beauty of the terrain, and the rich cultural diversity of the countries you’ll visit. Ayres Adventures took us on one of the best trips of our lives. With 13 friends we rode for a week through Patagonia. Ayres Adventures organized everything with professionalism, reacted really well to things that happened last minute that required decisions, change in logistics, etc and they made the trip fun and memorable for everybody. One of the best trips of our lives. Thank you! Wences created a video about his Patagonia Adventure. Click here to watch the video.